I first read this book many years back and I have to say, it has remained one of my favourite guides to Karate to date. The author, Shigeru Egami, studied Karate under Gichin Funokoshi (yes, as in the founder of modern Karate) and following Funokoshi's death went on to found the Shotokai style of Karate, which he believed to be a truer system; more loyal to Funokoshi's original system (which had become diluted through competition). I'll admit right now, that I've had a very limited amount of training in the Shotokai style. However, from the 12 hours of training (that is, attending three classes at two different clubs and a six hour advanced seminar) that I could bear I've come to the conclusion that the Shotokai system (at least the version I witnessed) is the worst bastardization of Karate currently known to man. 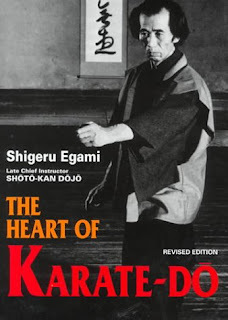 And I do genuinely feel really bad saying that because I really do love Egami's book, The Heart of Karate-Do. Strangely enough, I also feel that the Shotokai classes I attended seemed to ignore much of what's written in Egami's book (but at the same time, many of my friends have reported similar issues to my own when moonlighting at other Shotokai clubs). Regardless of my truly horrendous experience with Shotokai, this book affirms that not all Shotokai is without worth. "Animals are not muscle-bound; why should a man be? Pliancy and flexibility are natural characteristics of the human body; rigidity is the mark of death." The book includes a myriad of warm-up exercises and stretches (which was fairly unique at the time of its release) before proceeding to information regarding stances and offensive/defensive techniques. If you're looking for some of the lesser used techniques in Karate, this probably isn't the book for you (try Oyama's 'Essential Karate') however this book does have a surprisingly vast collection of Kicking Techniques. Egami pays a lot of attention to developing a strong, supple body – reflecting this; he provides a wealth of high and jumping kicking techniques that wouldn't be out of place in Korean or Northern Shoalin Kung Fu systems. Furthermore, the descriptions are easily understood and the photos (of which there is an ample amount) are clear and well shot. The Revised Edition uses brand new photos, which have been criticised for the new demonstrators not being able to match up with those from the original release. Personally, I own both editions (greedy, I know – okay, I lie… I thought they were two different books *hangs head in shame*) and the photos in the Revised Edition are much clearer and thus probably more beneficial to the target audience; the demonstrators while maybe not of the same calibre as in the original are still exceptionally good. Lastly, the best aspect of the book is simply its humble yet devoted tone. You can really feel the emotion and love that Egami had towards his Karate (it helps if you know a bit of Egami's history); inspirational and packed with solid information. "Train as much as you sleep." Recently I visit your blog and got some useful information regarding martial arts supplies.Your blog is a very good source for martial arts equipment and other type of arts and am agree with your thoughts that's Martial art is one of the best ways for self defense and can be learnt very easily. Once you know the Techniques involved in Martial Art you will be able to protect yourself from any danger.